Fodor's. For Choice Travel Experiences. Praise for Fodor's See It guides: "...everything from the latest dish on local hotels and restaurants to Web sites, the nearest tram and metro stops, to prices. Best of all, it's presented in a colorful, eye-catching format." -Frequent Flyermagazine Fodor's helps you unleash the possibilities of travel by providing the insightful tools you need to experience the trips you want. While you're at the helm, Fodor's offers the assurance of our expertise, the guarantee of selectivity, and the choice details that truly define a destination. It's like having a friend in Prague! 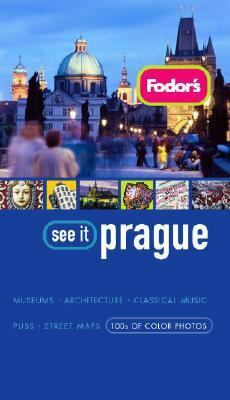 Fodor's See It Pragueis colorful and practical, detailing the must-see sights in Prague plus: COLOR PHOTOS by the hundreds show you not only Prague's sights but also hotels, restaurants, and shops COLOR MAPS galore, including neighborhood maps, city plans, transportation maps, and floor plans WALKING and DRIVING tours INSIDER TIPS by the dozen RATINGS for key sights Hundreds of in-depth HOTEL and RESTAURANT reviews Detailed PRACTICAL information in every listing Visit Fodors.com for more ideas and information, travel deals, vacation planning tips, reviews and to exchange travel advice with other travelers.Fodor's Travel Publications, Inc. Staff is the author of 'Fodor's See It Prague, 2nd Edition' with ISBN 9781400006939 and ISBN 1400006937.